“He’s Not Dead Yet” is the true story of one family’s battle against cancer. In the 28 colorful pages of this picture book, a young boy faces the death of his younger brother, and learns more about living. 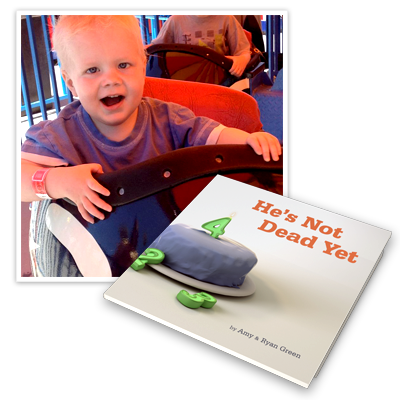 Surprisingly hopeful, and deeply moving, “He’s Not Dead Yet” speaks in rhyme to both children and adults. Joel was diagnosed with an Atypical Teratoid/ Rhamboid Tumor (AT/RT) in January of 2010. He had a surgery to remove the tumor and was undergoing 54 weeks of treatment including chemotherapy and radiation. In October of 2010, he had a tumor recurrence. Joel is 4 years old now. And has survived thanks to his family's faith and positive thinking.